Photolalia: Wildlife -- Some images... and a few brief words about them. (Oakland, 2007. Image copyright Hamish Reid. Click on image above for larger version). This is almost the view from my front window, a variation of a sight I see every day of my life across the road from my studio  a bunch of concrete trucks in the Redy Mix concrete plant, in front of the omnipresent ConAgra silos in (or right next to) Jingletown. This time, the concrete trucks seemed to be lurking like heavyset wild animals (hippopotamuses?) behind the wall of the Redy Mix yard, with the whole scene almost monochrome except for the tiny but very bright red light on the structure above the trucks and the subdued little splashes of colour on the trucks in the early-evening low overcast from the rainstorm moving in off the Pacific. I like the way this image works, and not just because it's a characteristic slice of my current life and pretty typical of my neighbourhood. 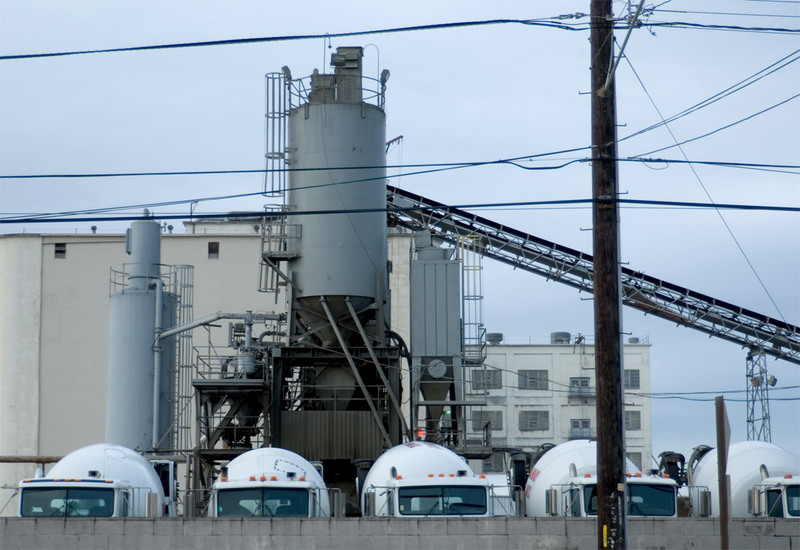 I think the geometry of the concrete plant, the trucks, and the silos all work together to make a nice image (the repeated cylinders, the diagonals, the rectangular windows and faces, the loping wires), and the subdued near-monochrome works to give an evocative atmosphere. But for me it's really that glimpse of the restless trucks lurking like animals in a pen that I wanted to capture: my days are full of the trucks, vans, shipping containers, barges, tugs, railway locomotives, bobcats, forklifts, roach coaches, industrial machinery, etc., that move past my studio and across the neighbourhood in steady streams at all hours. These things are the true wildlife of my neighbourhood: yes, there's a few ducks and geese in the Estuary, the usual stray cats and dogs in amongst the concrete plants, factories, and workshops (and even, once, a snake slithering across my street), and surely a bunch of rats everywhere, but the real wildlife, always scurrying or brooding or lumbering around the Jingletown, San Antonio, or Fruitvale districts is much more varied and interesting (at least to me). It's amazing how easy it is after many years of living here to be able to tell different types of trucks solely by the sound of their brakes, to be able to identify individual heavy barge types from miles up the Estuary by their wake, to see how the shipping containers are moved around constantly to graze on different lots over a month or two before being sent back to Japan or China or wherever, and to see the same familiar concrete trucks plying the same few hundred metres between the freeway and the (three) concrete plants around here every day. (Note: this shot was done hand-held in rapidly fading light; I'm sort of amazed it turned out at all, let alone as sharp as it did (it prints well up to A2). Yes, there's a lot of chromatic aberration and fringing going on in the highlights, but that's a small price to pay for being able to get any shot at all).